As an independent contractor, there are a few tax write-offs that you need to know in order to save a fortune when Uncle Sam comes knocking. That’s why we’ve provided you with the free 6 Tax Write-Offs for Independent Contractors template. This is a simple Word document that contains everything you need to do your taxes and get more than you dreamed possible back. These tips are some of the biggest and best for independent contractors. If you’re not using these deductions then you’re really missing out. 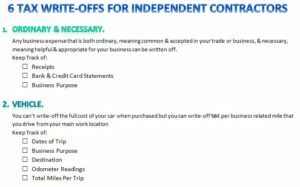 If you want to get the most out of your taxes as an independent contractor then follow the guide below to learn how to use and download the free 6 Tax Write-Offs for Independent Contractors template today! To download the free tax template you can follow the link at the bottom of this page. Decide whether you want to keep your checklist digital or print out a physical copy. If you want to print the sheet then click the “File” button then choose “Print” from the list of options that will appear. Next, go to the top of your page and start in the “Ordinary & Necessary” section. Make sure you have all the items listed and check them off as you go. As you can see the next few sections ate for vehicles and travel. You might be an independent contractor but you can definitely write off miles traveled, entertaining clients, and keep a home office. As you go through your checklist you’ll probably notice a lot more items that you would never have thought to write off for your taxes. This template gives you the tools and the confidence to complete your taxes on time and with hopefully with some cash to spare.